Toni shooting a gun in front of the Big Shot Casino. 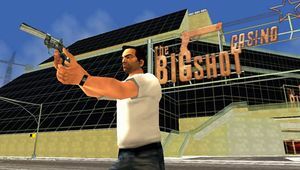 The Big Shot Casino, located at the Torrington district of Staunton Island, Liberty City, was a casino owned by the Sindacco Family in 1998, the setting of Grand Theft Auto: Liberty City Stories. When the Leone Family kicked the Sindaccos out of Liberty City, the Yakuza took it over and made it into Kenji's Casino. Toni Cipriani also kills Kazuki Kasen on the roof of this casino in a Katana duel, since he was about to kill him and his wife, Toshiko. This page was last modified on 16 March 2017, at 21:58.